Wow, I had no idea Venus was so close! HOW would you like to experience the thrill of a parachute jumpâ€” without the accompanying dangers of the ‘chute failing to open, of being blown out to sea or of landing in a tree? Well, that thrill will be yours if you are one of the lucky 60,000,000 expected to visit the New York World’s Fair after it opens on April 30. As a matter of fact, a safe parachute jump will be only one of the many sensations ingenious engineers have invented for the Fair visitor’s amusement. If the ‘chute jump seems tame, try the aerial ship which the rider can pilot himself. It’s safe, of course, because a cable keeps the ship anchored to a revolving pole, but you can turn or stall in a steep climb or experience the sensation of a power dive, if you are up to it. The parachute jumping tower has been accorded concession No. 1 at the Fair because of its spectacular features. It will be the largest of its kind in the worldâ€”250 feet high, equivalent to a 25-story buildingâ€”and 11 gayly colored parachutes will be in constant operation. The ‘chutes are permanently open on metal spreaders. Passengers are strapped into the seat (which holds two at a time) and are hauled to the top of the tower by a cable and electric hoist. An automatic release starts the drop. The ‘chute, which is guided by four vertical wires to prevent it from swaying and drifting, glides gently to the ground. A special arrangement of shock absorbers “breaks” the landing so that the ‘chute comes to an easy rest. Invented by Commander James H. Strong, (retired) for the original purpose of training fliers to parachute from their planes, it was decided to convert the idea into an amusement offering when it was realized that everyone who saw the tower wanted to take a ride â€”and was willing to pay for it. 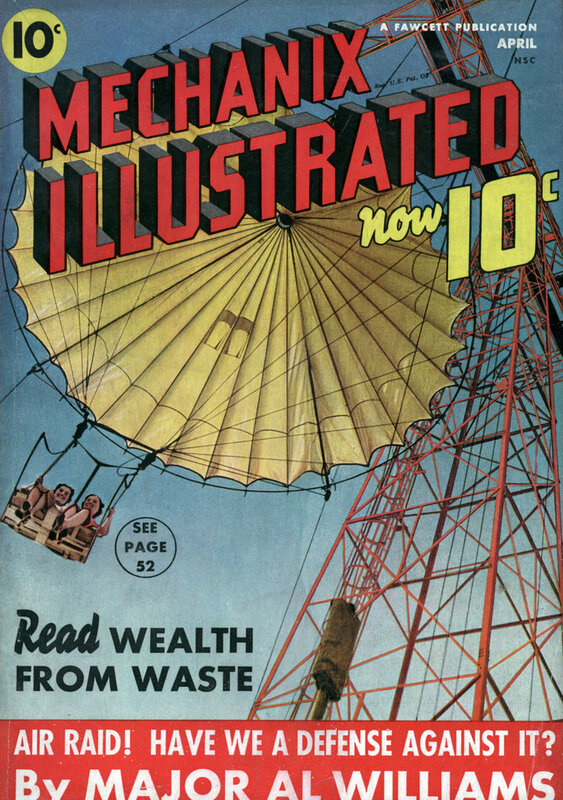 A smaller version, first tried out at the Chicago Fair, indicated that the parachute tower is destined to become a permanent part of American midways, just as no amusement park is complete without its roller-coaster. It’s a step from an airplane out into the open spaces in a parachute. The reverse of this will be true at the Fair, where it will be just a step from the parachute jump to the aerial joyride where the air enthusiast can pilot his own plane. The only catch is that the plane is hooked to a cableâ€”fortunately! Sixteen planes will circle in a 140-foot radius around a supporting tower 65 feet in the air. The planes are designed with a smooth-action, synchronized double-rudder, controlled by a “stick” which permits the rider to maneuver the craft in an alternate climb and glide action. Under skillful handling the plane can be made to climb and bank past the perpendicular and to swoop earthward from the top of the climb to within a few feet of the ground. 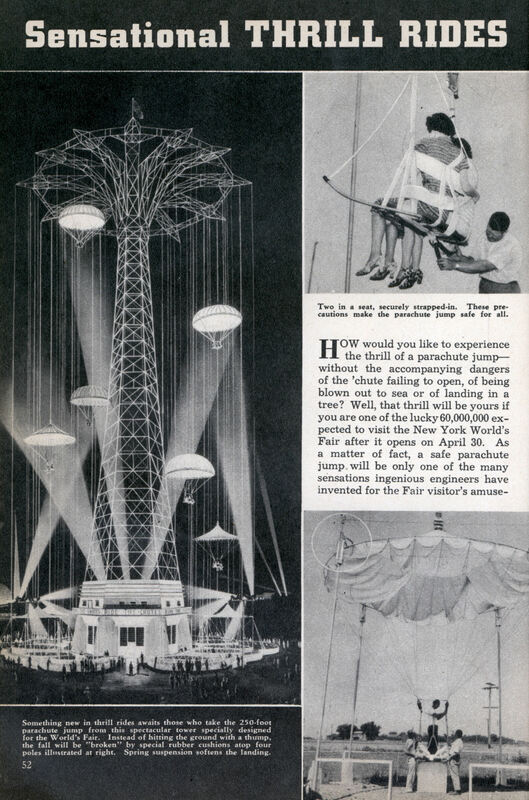 Designed by Norman Bartlett of the Spillman Engineering Co., the aerial joyride will be another invention which will make a permanent contribution to the fair midways everywhere. Aerial conscious inventors have given free play to their imaginations, and have developed the Stratoship for the amusement of space-minded thrill seekers. This is a ship of rocketlike design which pivots at the tip of a 26-foot boom. The truss carries the ship high into the air, and as it flashes around in a circle, a 1-h.p. motor turns the rocket ship completely around so that you fly upside down as well as right side up. The ship itself is a welded tube 15 feet long, equipped with safety belts. As it takes its passengers on a zooming, zipping, dipping, banking, rolling, breath-taking, hair-raising, thrill-packed ride, they can well imagine themselves on a flight to the moon. As a matter of fact, one smart inventor has devised a ship that takes passengers to Venus, which is part of the way to the moon. Unlike the other rides, his rocket ship never really leaves the ground, but for all the sensation accompanying the trip, you would never know it. This latest is “Flash Gordon’s” own rocket ship, designed by George H. Messmore and Joseph Damon. It is 80 feet long and seats 125 people. Once filled, the doors are closed, levers are turned, switches pulled, “anti-gravity” and forward-speed controls are manipulated and suddenly the ship is in darkness. As you watch from the observation tower the ship seems to enter outer space. Familiar constellations flash by and presently the ship lands on Venus. Another door is opened and the passengers alight on a strange planet, where animated images of prehistoric animals and iron-clad “Martians” present a fascinating show. The flight through space is actually a movie flashed on the screen, but the illusion is effective. For those who desire to remain on terra firma for their thrills, the midget auto and race track has been brought to the mid-way. Not quite a new invention, its availability as a thrill ride places it in a class with rocket ships. Perhaps the best thing about the midget racer is that it is equipped with its own gasoline engine, and the passenger drives it under its own power. Visitors will be able to drive their midgets around a circular track, with banked turns, at speeds up to 30 miles an hour. To add to the sensation of movement, the ingenious inventor designed a mechanism that moves the track in the same direction as the cars! Another speedway, using an oval track with flat turns, and fast midgets powered with two-cylinder motor cycle engines of 6 h.p., will add to the enjoyment of fun-seeking visitors. A feature of the cars is the clutch which starts in high without jerking and automatically releases when the engine idles or the car suddenly stops. Another feature is that the brakes operate upon releasing the foot pedal instead of when the pedal is applied, as in standard cars. These features provide added safety. The car is completely surrounded with bumpers. “Plenty of thrills and no spills” is the theme song of this midget raceway. A variation of the familiar roller-coaster is the bobsled ride devised by Norman Bartlett. The bobsled is hauled to the top of a 65 foot tower, from which height it flashes down the runways, banking perpendicular on a dozen turns, at a mile a minute. Like the parachute jump and the aerial ride, the bobsled promises to be among the most thrilling rides devised by inventors to give World’s Fair visitors a thrill. Framework of the track is of steel ribs with a board track. The sled goes down on casters oiled for speed. These are no sissy rides, and if it’s a thrill you want, you’ll get it at the New York World’s Fair!